Along with these, one can create their own directives. The HTML compiler traverses the DOM coordinating AngularJS Directives against the DOM components at the point when Angular bootstraps an application. This tutorial explains how to create and implement custom directives in Angular projects. AngularJS Directives are extended attributes of HTML with a prefix ng-, so they are called as Directives. Directives add interactivity to HTML and extends the functionality of HTML elements. AngularJS Views binds the data from model to the HTML template page. 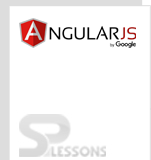 AngularJS Directives tells the AngularJS how to bind the data from model to the HTML template. An AngularJS application is initialized or defined using ng-app directive i.e AngularJS will know that this is the root element of the application when ng-app directive is seen. Every application working with AngularJS should have a root element. Whenever the web page is loaded, ng-app directive will bootstrap (introduce) the application naturally when a web page is stacked. Only one ng-app directive is allowed in a HTML document. If ng-app directive is defined multiple times, the first which is declared will only be considered. In the below syntax, ng-app is given in html tags which is mostly used and shows that the AngularJS application starts from html element. It can also be used with any other html element also. An application data is initialized by ng-init directive and allows to evaluate an expression in the running scope. But in case of real-time applications, instead of ng-init it is recommended to use controller to initialize the value on a scope. Normally, moving data from model to the view is easy, but there is a different directive that has to be used to move data from the view to the model. And that directive is, ng-model. With ng-model an expression can be specified, like username, and ng-model will push the value of the input given by the user into $scope object using the expression. The ng-model directive is used to bind HTML value Form controls ( select,input,textarea) to application data. 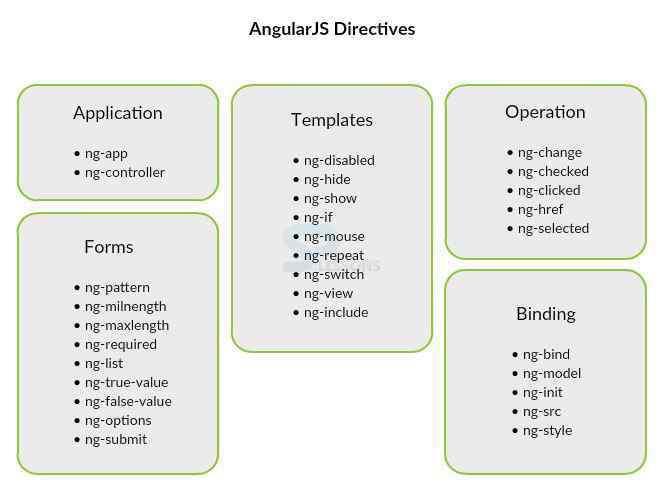 The model/variable that has to be used in AngularJS application is defined by ng-model directive. The ng-repeat directive repeats the specific HTML elements a given number of times. A HTML set repeats once per item in a collection which is an array or an object. Every repetition instance is given its own scope consisting of the present item. Directives are extended HTML attributes in AngularJS and has a prefix ng-. An AngularJS application is initialized or defined by the ng-app directive. The ng-init directive initializes the application data and allows to evaluate an expression. The ng-model directive is used to bind the value of HTML Form controls. The ng-repeat directive repeats the specific HTML elements.